Can we have our child baptized? Can I be baptized? In almost all cases, absolutely! 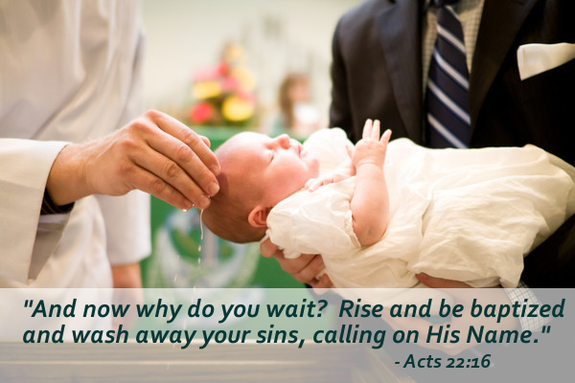 In most cases, if you've been baptized before, there is no reason to be baptized again. But if you've never been baptized and would like to be, please call the church office to talk to the Pastor and schedule a day and time. What is required for Baptism? Only the desire to be baptized and the understanding that our Lord always connects baptism and teaching. Baptism is not a "get out of hell free card" or a magic wand that makes us Christians. Baptism and a living faith in Christ are what save us. In the case of children, we baptize and then teach in Sunday School and Confirmation. In the case of adults, we teach the Faith first and then baptize in accord with the example of Acts 8:35-38. Absolutely nothing. In fact, our congregation gives gifts to the baptized to help them remember their special day! While some groups insist on a specific mode or method of baptism, the Greek word βαπτίζω simply means "to wash with water." The mode (pouring, sprinkling, immersing) is not specified, and a baptism with water in the Name of The Father, Son, and Holy Spirit is always valid no matter how the water was applied. Redeemer's baptismal font is best suited for "pouring" and the font is in the center of our sanctuary to remind us that baptism into Christ is central to our faith.